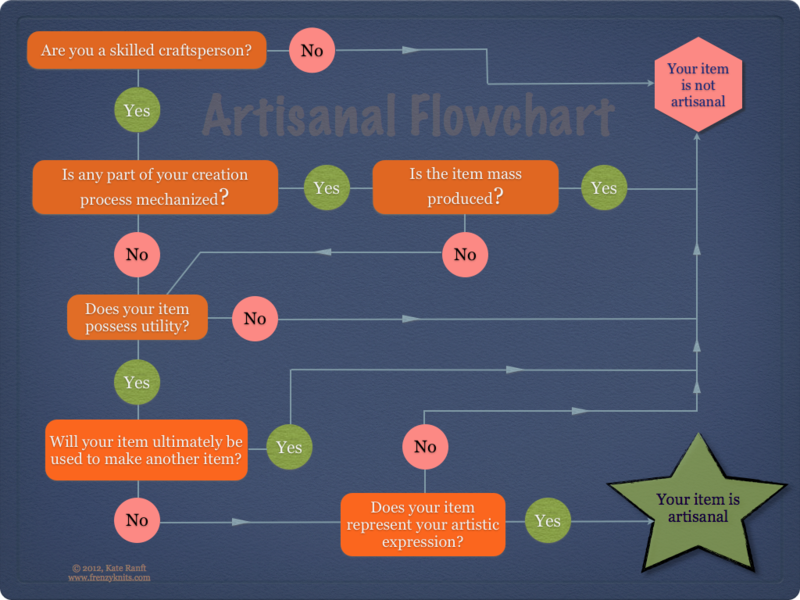 Use this handy flowchart to determine whether your item is indeed artisanal. Skilled craftsperson. First and foremost, for an item to be considered artisanal, it must be made by an artist or craftsperson who has achieved a high level of mastery. This includes practitioners of the applied and decorative arts. It excludes anyone under the generally applied monikers of crafter, dabbler, and hobbyist. Mechanization and mass production. It is barely conceivable today that a craftsperson could create an artisanal object without the use of a tool. The question, of course, is how much mechanization can a craftsperson use and still consider the item hand-made. The dividing line rests at automation. If automation is used to mass produce the item, it is no longer made by hand, and thus, is not artisanal. Utility. If an object exists solely as art, the artisanal question is mute. Therefore, utility is the next consideration because of its connection to the applied and decorative arts. Practitioners of these arts create items that can be used or perform–at least in concept–some function, like pottery, glassware, textiles, and furniture. Ultimate use. If the item possesses utility but its raison d’etre, so to speak, is not to exist as an end in itself but to perform as part of another item, it is not artisanal. Yarn, for instance. It can be well-made. It can be exceedingly beautiful. Its purpose, however, is to be used to make other things: weavings, shawls, or purses, etc. These items are end products and this is where the quality of artisanal ultimately rests. Artistic expression. This is the final determiner of artisanal quality. After fulfilling all of the above qualifications, the item is not artisanal if it does not communicate the artistic vision of its creator. Again, it may be well-made. It may be beautiful. It must also express or stand for something beyond itself, something that originates within the artist or craftsperson who made it.